A series of brutal, unsolved murders in Whitechapel, and Scotland Yard, as usual, is at a loss. It’s a good thing that the position of “consulting detective” has been invented and that Sherlock Holmes is on the case. As one of the Baker Street Irregulars, you’ll follow your own leads and using a map of London, a directory, and the day’s newspaper hopefully be of some help to the master detective (or at least not look silly in his presence). Sherlock Holmes Consulting Detective: Jack the Ripper & West End Adventures is a stand-alone game in the Consulting Detective series. Players are members of the Baker Street Irregulars, assistants to Sherlock Holmes. Players will cooperatively follow leads, study clues, and try to answer Sherlock Holmes’s questions at the end of the case. 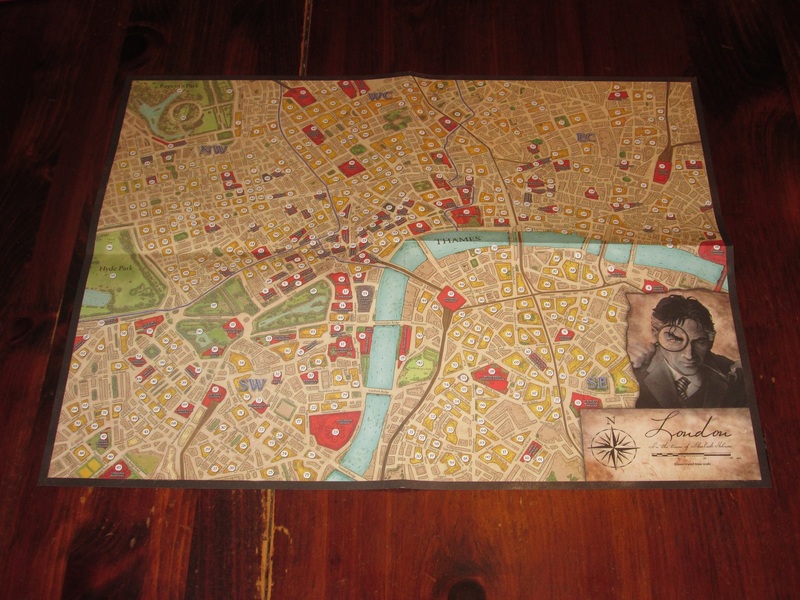 To begin, players take the casebook for the case they’re playing, all of the newspapers from this case and previous cases, the map of London (or Whitechapel), and the London directory and place them on the table. One player reads aloud the introduction, and the game begins. The newspapers. Sometimes there is helpful information in here, but it’s up to you to find it. On a turn a player can follow any lead he or she wishes. Leads are tied to addresses, which can be found in the casebook, in the London directory, in the newspapers, or on the map of London. There is little in the game that is on rails; players decide where to go and which leads to investigate further. The Game Is Afoot, or Elementary? When I played Sherlock Holmes Consulting Detective (now known as “The Thames Murders & Other Cases”), I fell in love with it, as did my sister and my wife. It was an immersive experience unlike anything we’d ever played. It felt like an episode of Masterpiece Mystery!, only instead of having to follow the linear path of whoever was that week’s detective, we could follow our own meanderings through Victorian London. 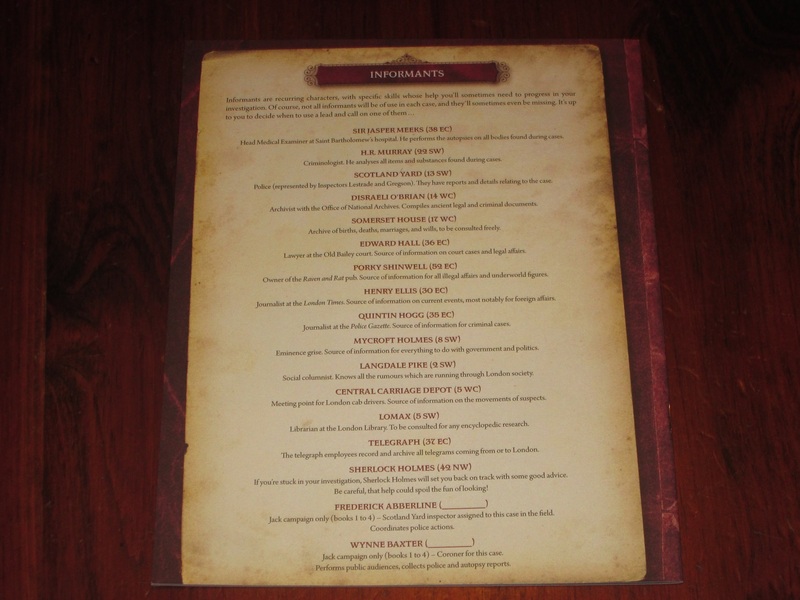 But as each case in Sherlock Holmes Consulting Detective can be played only once, there is the constant hunger upon completion for more cases. 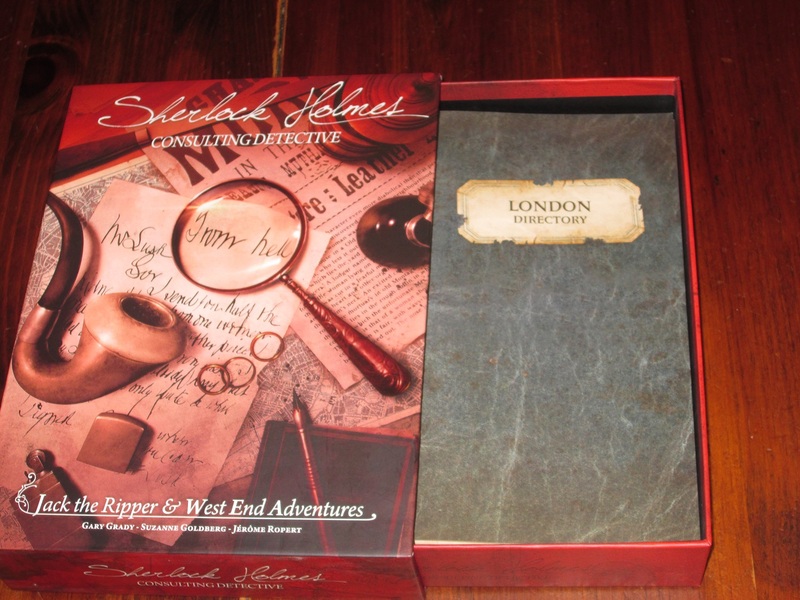 Jack the Ripper & West End Adventures is a stand-alone “expansion” to Consulting Detective. Really, rather than an expansion, it’s a wholly new game: there’s no component that carries over from one game to the other; each box is self-contained. Only the system remains the same. The draw to Jack the Ripper & West End Adventures is twofold: 1) new cases in the same vein as previous cases, and 2) a new kind of Consulting Detective experience, a four-case linked campaign to catch Jack the Ripper. I’ve not played all of the “West End Adventures” cases, but the cases I’ve played are quite similar to the cases included in the first Sherlock Holmes: Consulting Detective. These should not disappoint fans of the series. 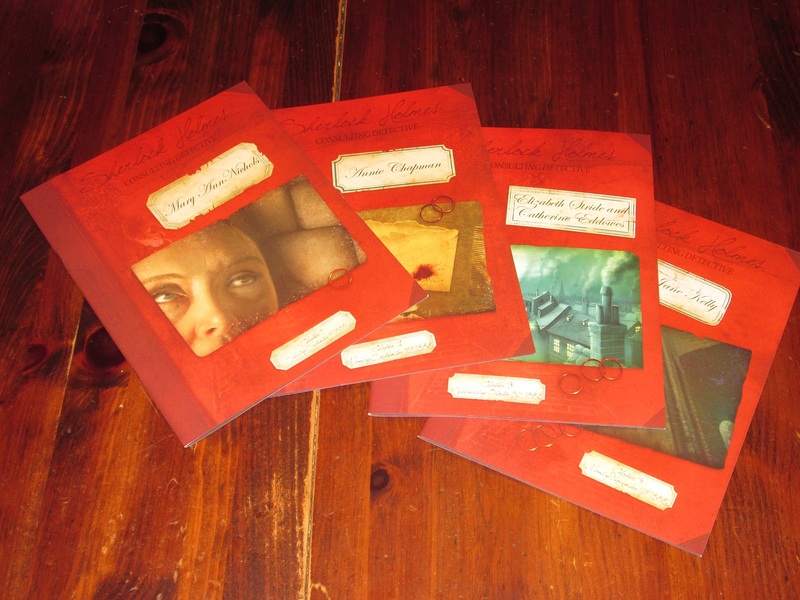 The Jack the Ripper campaign is four linked cases, each with their own casebook. But if you’re already a fan of the series, you’re probably reading this review to find out about the Jack the Ripper campaign–after all, if you liked the other Consulting Detective, the new cases are a no-brainer. While I don’t find the Jack the Ripper campaign to be as exciting as the normal cases, it’s still a decent way to experience Consulting Detective, as long as you can stomach the real-life cases’ gory details. 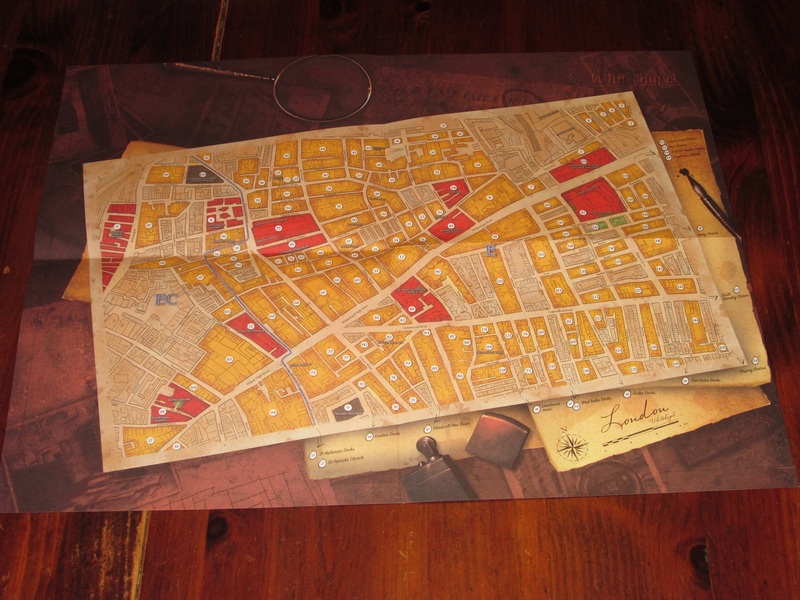 The Jack the Ripper campaign uses an included map of Whitechapel in addition to the larger-in-scope London map. Okay, back to the campaign. 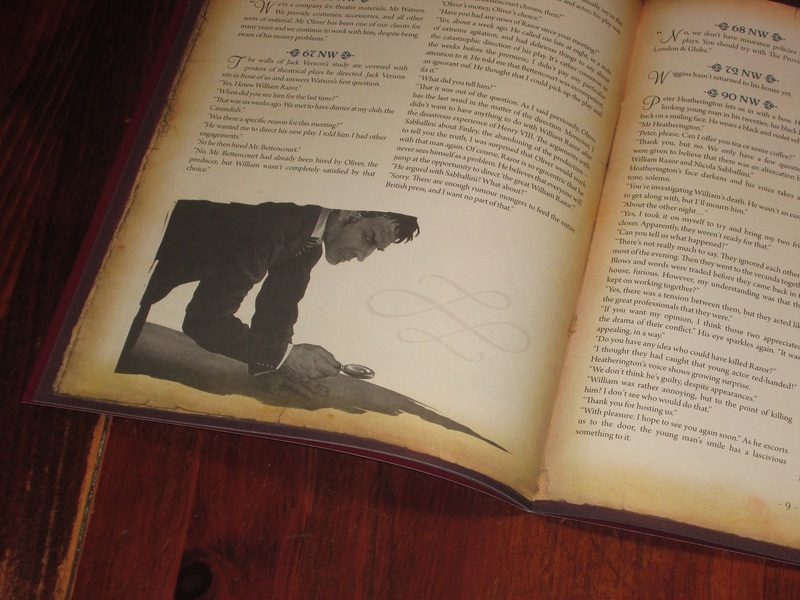 The casebooks are illustrated throughout. Some of the illustrations are frightening, but these illustrations (I’ve found) have little bearing on the case. The Jack the Ripper campaign is a campaign in one sense, in that it’s four linked cases that tell a single story, but it’s less of a campaign in that decisions you make in one case do not persist into the next. There is still some interest here: you’ll notice recurring details that get sharpened from case to case, and you’ll get a clear sense of the way a serial killer might disrupt a neighborhood (to put it mildly), and the last case in the campaign does draw the details of the other cases together. So even if each case has a stand-alone “solution” (as much as a solution can be offered for a series of unsolved murders), the story that connects the four cases is an interesting hook. I was initially disappointed that my decisions (read: poor score) didn’t have consequences in the next scenario, but in hindsight, this is for the best. 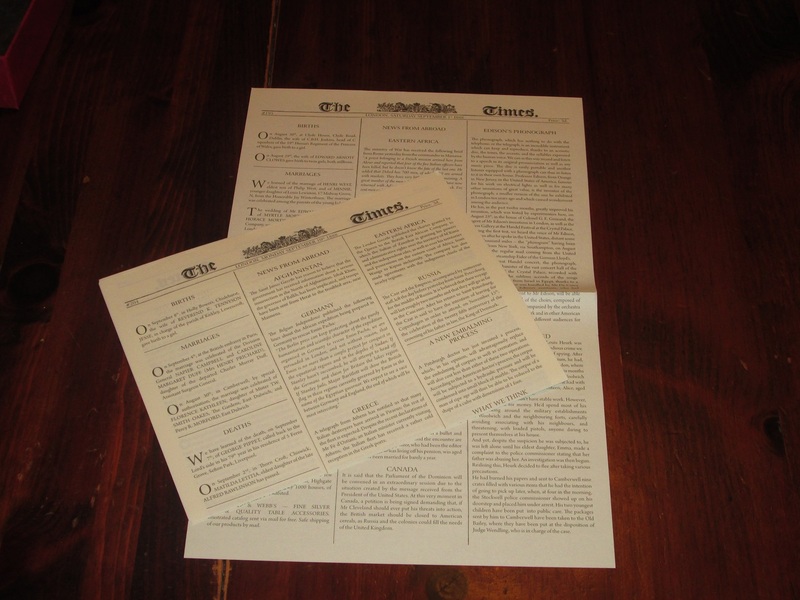 New newspapers are included that deviate from the standard Times format. 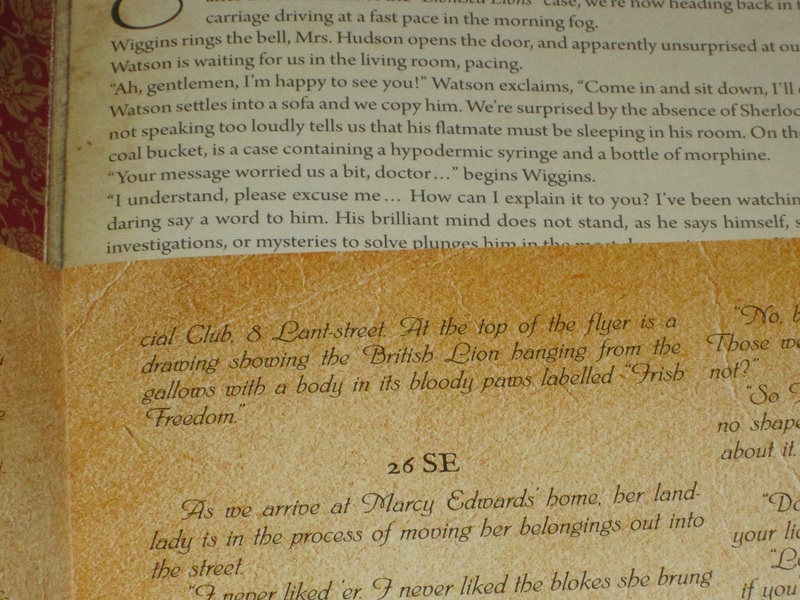 For all that I’ve said about the gory details (and please take my caution here seriously), the game manages to maintain at least some of the charm that players have come to expect from Sherlock Holmes Consulting Detective. Witnesses are still strange, Wiggins still gets in his wry observations, and Lestrade still looks like a fool. (Seriously–is it ever worthwhile to visit Scotland Yard?!) The four linked cases are more serious and disturbing, it’s true, but there’s still a commendable believability to the world-building, and the characters still feel like themselves. This is such a small thing, but it is quite satisfying to pull the answers from the attached envelope. The Ystari look is on the left, the new Space Cowboys look is on the right. The new edition looks and feels much nicer, in my opinion. To me, the aspect of the campaign that most recommends it is its inventiveness. Again, while I find the Jack the Ripper setting too dark for my taste, entering into a historical case and having a real prospect of solving it (at least within the parameters of the invented world, obviously) is a very cool hook. The way the campaign is clearly in the mold of Consulting Detective while offering some modifications to fit the setting gives me hope for future cases in the series once the publisher runs out of reprinted material from the original cases. The Ystari edition font is on the bottom, the Space Cowboys on the top. The new cases are much more legible. The components in Jack the Ripper & West End Adventures are fantastic. The two-part box that looks like a big book is well done. The redone graphics look great (although some of the illustrations are disturbing, even in non-campaign cases). 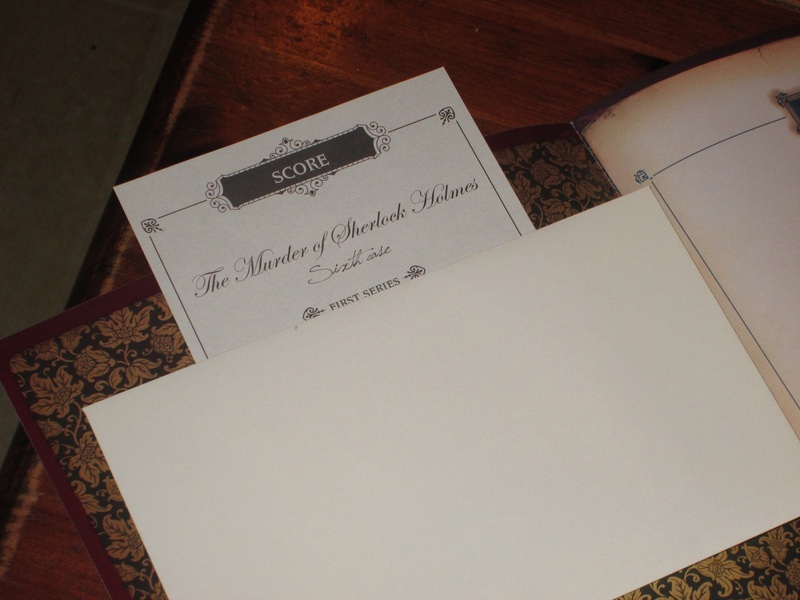 The answers to the questions posed at the end of each case are now enclosed in an attached envelope, which while unnecessary, gives the game a feeling of finality once you’ve solved the case. Perhaps the biggest gain in this edition over the Ystari edition of the first cases is the casebook font. The font is now legible, which is a huge boon to the game. There were so many instances in the Ystari game where we were just trying to parse what the letters were instead of mulling over what a clue meant. 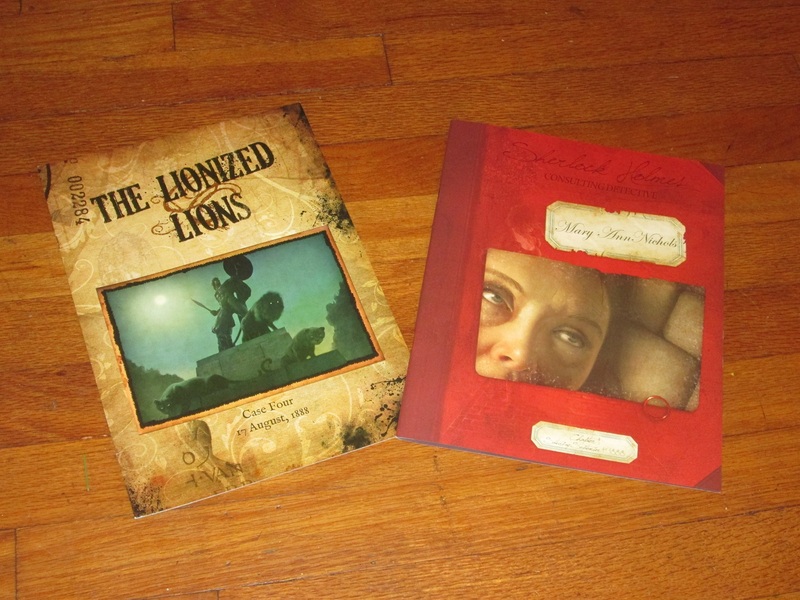 The included books and map are all on thick matte paper that just feels like it’s a quality material. 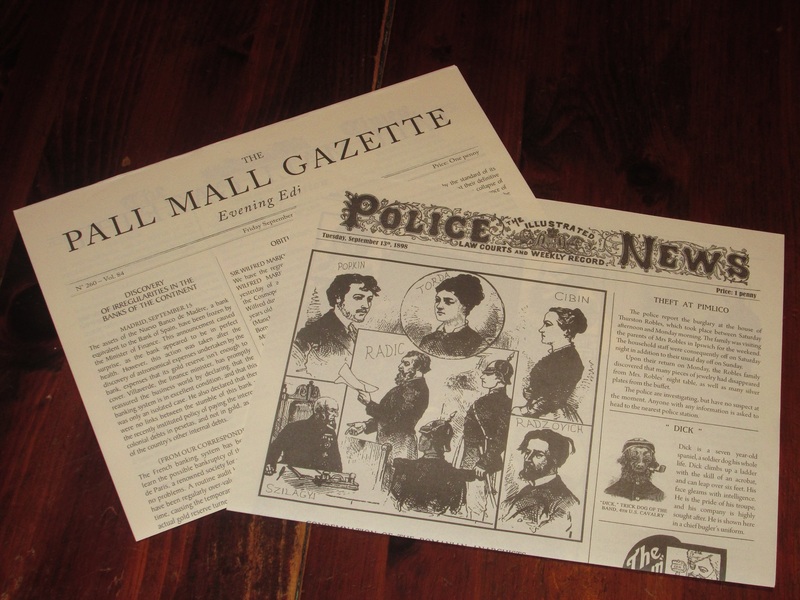 The newspapers are a delightful component and look great (and so much care is invested in even the stories that have no bearing on the case–they just provide nice flavor). This is a good, well-made product that should stand up to multiple groups enjoying it. The presentation here is excellent. And now to the price. 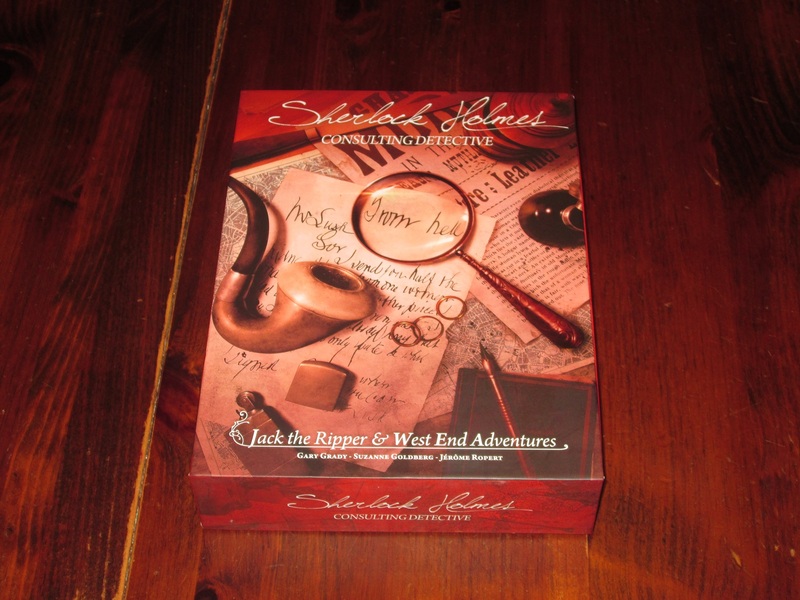 The MSRP of Jack the Ripper & West End Adventures is $49.95, with limited online discounting. Some may balk at this for a game that is all paper, but let me stress to you that there is so much game in this box. It’s true that you can probably play each case only once, but at least the way we play it, each case is something to be savored and usually lasts us two to two and a half hours. When you consider that most tabletop escape rooms (including Space Cowboys’ Unlock! series) bill themselves as one-hour experiences and cost around $15, ten cases that last around twice the amount of time for $50 is quite a steal. Now, is it still worth it for you if you aren’t interested in the Jack the Ripper campaign? I would say yes–even six cases at around two hours each for $50 is worth the cost. Granted, I’ve not played through all of the cases in West End Adventures yet, but even the somewhat bogus cases in the first Sherlock Holmes Consulting Detective (rebranded “The Thames Murders & Other Cases“) game were still fun to solve, even if they ended in an unsatisfying way. I rate the original collection a 9/10. If you aren’t interested in Jack the Ripper and want more bang for your buck, you won’t be disappointed with “The Thames Murders.” But my guess is once you play that, you’ll be back for at least West End Adventures anyway, such is the strength of the system. A map of London. The game is afoot! As far as narrative-based games are concerned, the Sherlock Holmes: Consulting Detective system can’t be beat, and Jack the Ripper & West End Adventures is a fitting successor to the first game. It combines literary homage with a compelling system to solve cases, all while maintaining the charm of characters that many of us have grown to love. While I’m not thrilled with the Jack the Ripper campaign (mainly due to thematic concerns), I think it will appeal to Consulting Detective fans who want more cases, and the inclusion of West End Adventures makes this a worthwhile purchase even for those who, like me, have a weaker stomach for grisly murders. It certainly fits the bill for additional cases for one of the best narrative games out there. iSlaytheDragon would like to thank Asmodee North America for providing us with a copy of Sherlock Holmes: Consulting Detective: Jack the Ripper & West End Adventures for review.